It is not uncommon for Mark and I to load up the kayaks, pack up the car and head out of town for a day or two in search of some good water. 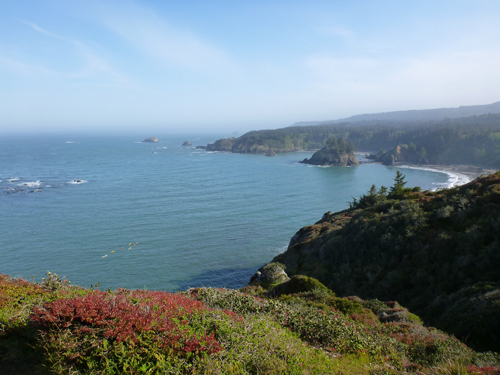 When traveling by car we usually ask ourselves if we want to go north (toward Oregon) or south (toward the Bay Area) and how far we want to travel. Those two factors determine where we go. 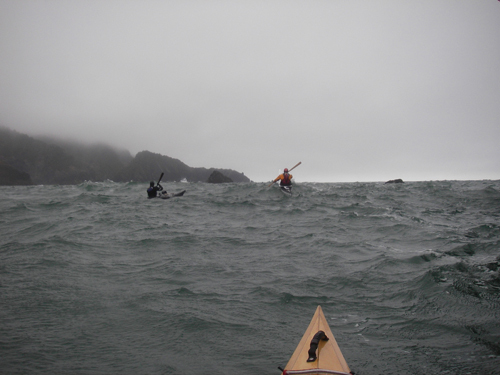 The last few times we’ve done this we’ve found ourselves hit by gale force winds, sideways rain and large swell. We’ve gotten used to it and laugh about it, but this time, we decided to do something different. Rumor had it that if we headed east, toward Lake Shasta, we’d run into temperatures in the 90s and a lake with an unusual amount of water in it. 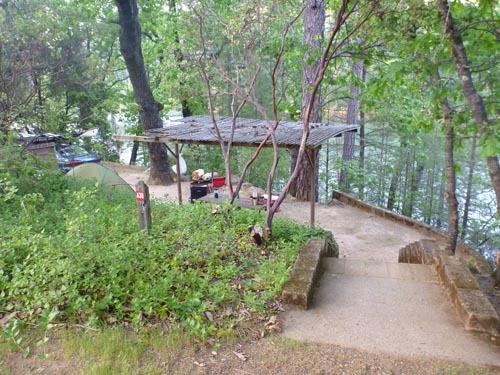 Because Memorial Weekend had not hit yet, the campsite would be empty and we’d have much of the place to ourselves. After a quick Google search, we booked a campsite at the Antlers RV Park and Campground. We’d never been to Lake Shasta, but were determined to find a little bit of touristy fun. Upon arrival we were fairly impressed with the campsite. Our camp was on a cliff overlooking the lake. There were two sets of stairs that let to the site, two picnic tables, a wooden cabinet for food (we opted for the car), a fire pit and a table, complete with a decorative shade covering. Not the type of camping that we’re used to, but we were loving it! During our stay we went on two paddles. One was up one of the many arms that make up the lake, and the other was toward more open water. Besides from a few powerboats and the occasional houseboat, we seemed to have the place to ourselves. We were told that from Memorial Weekend on there can be up to 5,000 boats on the lake at any given moment, which made us glad we’d gone so early in the season. 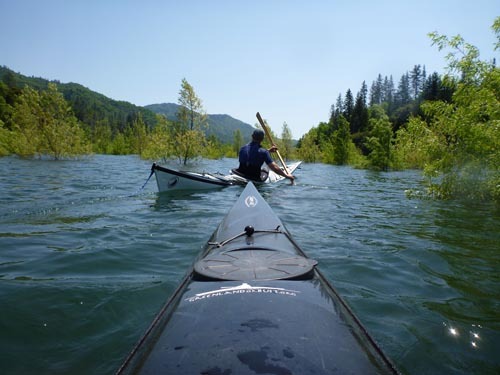 The water level is so high this year that a kayaker can have a lot of fun paddling through an underwater forest. Every now and then we’d find a sandy beach and go for a swim in the cold water. 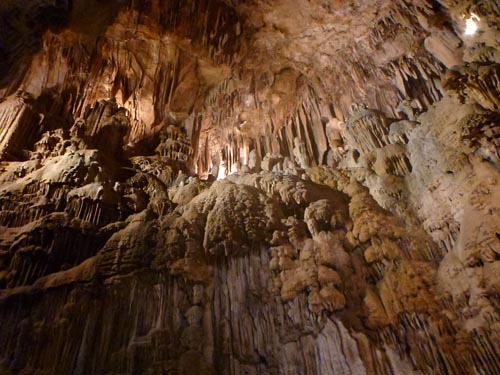 The Shasta Caverns were a close attraction, and we went on the tour, which came complete with a boat ride across the lake, a bus ride up a windy cliffside and finally the caverns themselves, which were spectacular. 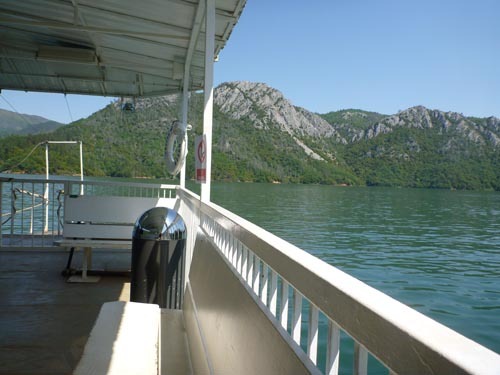 An empty boat takes us to the caverns on the other side. 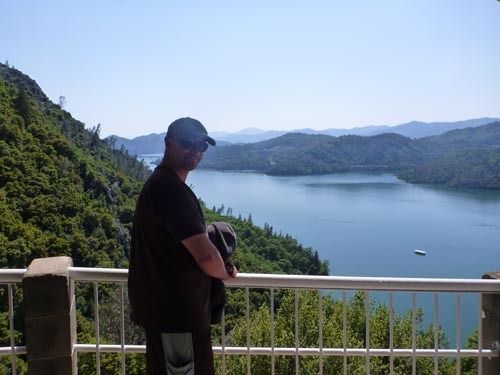 Mark enjoying a view of Lake Shasta from the entrance to the caverns. Spectacular formations inside one of several caverns. Mark chillin' at The Basshole. As we drove away from the campsite feeling relaxed and slightly sunburned, a large bear stood in the road before us. We had disturbed his quiet morning walk, and he wasn’t prepared to let us pass. Slowly he turned around and started to trot down the road. Since he was heading the same direction as us, we followed him, and eventually he skirted into the bushes on the right side of the road, disappearing for a moment before darting out in front of us again to run to the other side of the road. Unfortunately, none of our bear pictures turned out, but seeing him was a wonderful end to our fun, and very different, road trip. 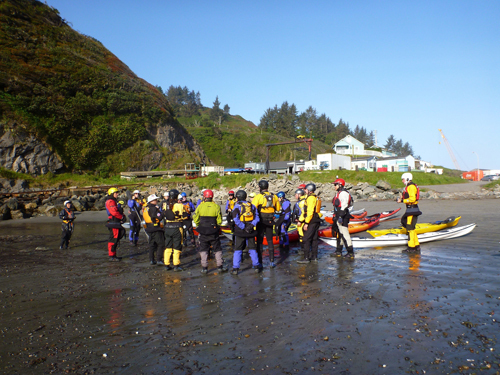 May 3 to 6 was Explore North Coast‘s Annual Sea Kayaking Social. 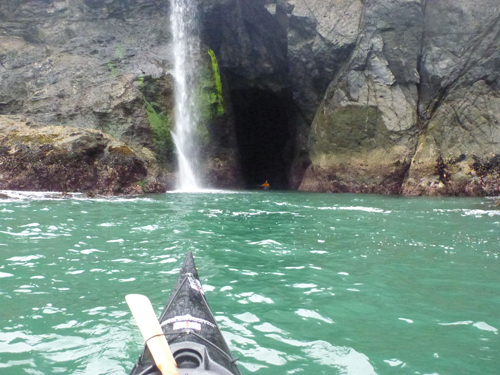 The purpose of this event is to bring California kayakers together for a four-day weekend of paddling in the Club’s local Humboldt and Del Norte County waters. 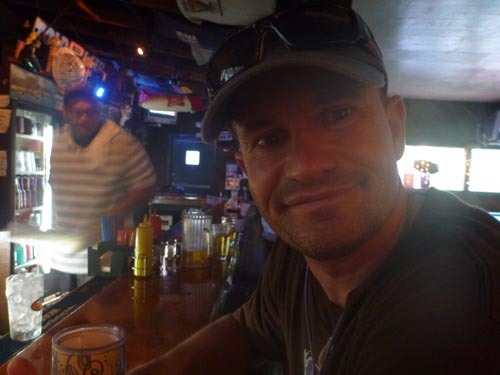 The weekend is free and informal, and most of the organization is handled by one person, Mike Dedman. The event is always a fun one, with lots of activities to choose from each day. 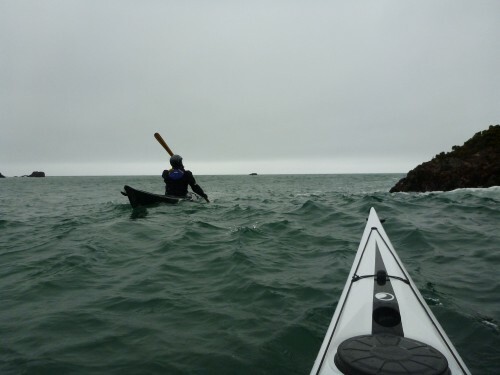 These activities range from protected paddles to ocean paddles. 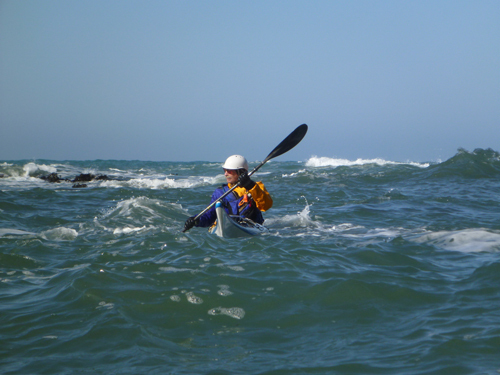 The ocean paddles are further separated into groups of open ocean or rock hopping and surf zone play. Due to a rigorous yoga teacher training schedule that weekend, I was unable to participate in most of the activities, although Mark was there for just about all of them and let me know that fun was had throughout the entire event. The weekend began with a leisurely paddle at Stone Lagoon. 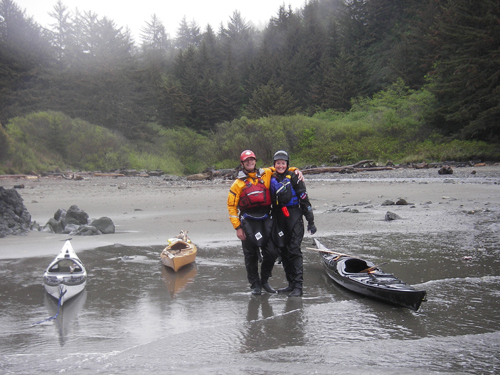 This gentle paddle led participants to a sand spit that separates the glassy lagoon from the wild Pacific Ocean. Drinks and food were shared on the spit before participants casually made their way back across the lagoon to the parking lot. 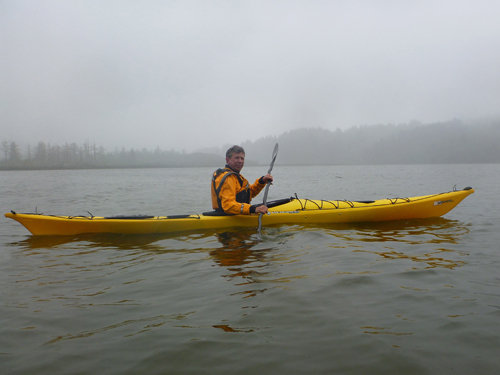 Tom paddling on a foggy Stone Lagoon. A great evening for a paddle. 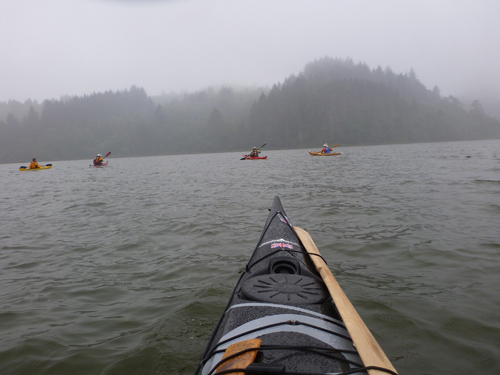 Throughout the weekend there were two paddles at Trinidad and a field trip up north to Crescent City in Del Norte County. 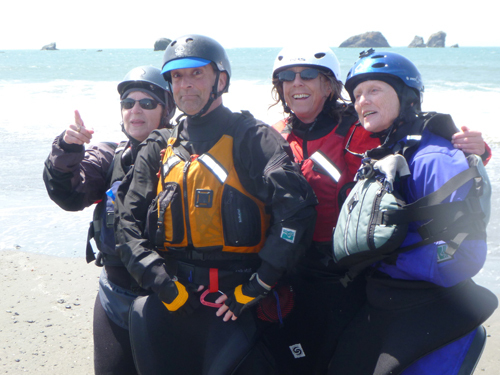 Here participants were given the option of a surf play day or a windy paddle around Castle Rock. 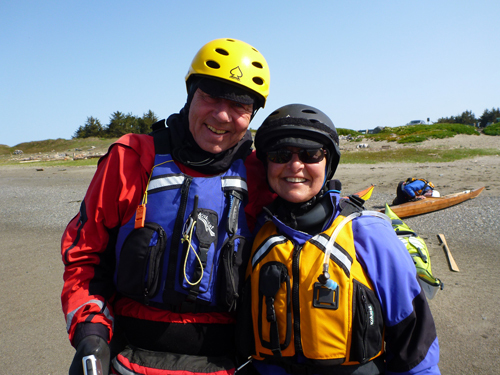 Others opted to stay in Humboldt for a leisurely paddle down Mad River Slough. Friday evening brought about a fun and lively potluck, and Saturday evening tired participants met at the Seascape restaurant in Trinidad for some tasty seafood. Karen, Michael, Shawna and Mary relax after an epic journey around Castle Rock. Rock garden play in Crescent City. Mark and Charlotte enjoying the sun. All in all the weekend was a great success. 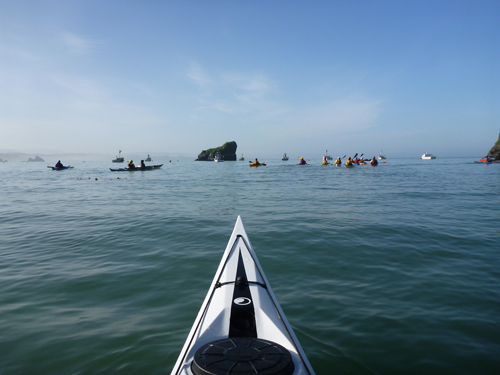 Thanks to Mike Dedman for putting it together, and for the many paddlers who came to visit. We hope to see you all again here next year! A large group and a gorgeous day. Local paddler Larry plays just north of Trinidad State Beach. Pictures by Mark and Helen. Caves and tunnels and rock gardens, oh my! There’s something magical about a sea cave. Those on land or hiking in the cliffs above aren’t aware of the marvelous places nestled in the rock just below their feet. Motorized boats can’t get close enough to see them, and they are unaccessible by land. 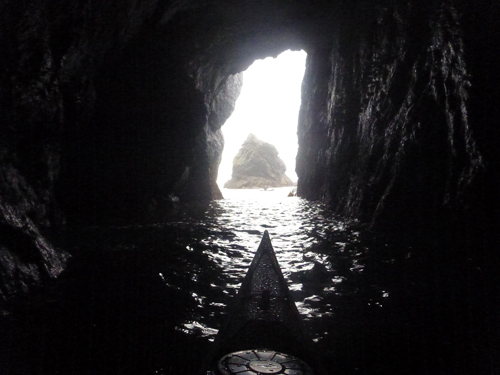 A kayaker in a sea cave can’t help but feel a deep sense of awe, amazement, mystery and solitude. Water drums in cracks in the walls, surf echos in dark corners and the hollow smell and cold still air in the cave all make it unique. Some caves have underground rooms, and mysterious colorful light shines up through the water. 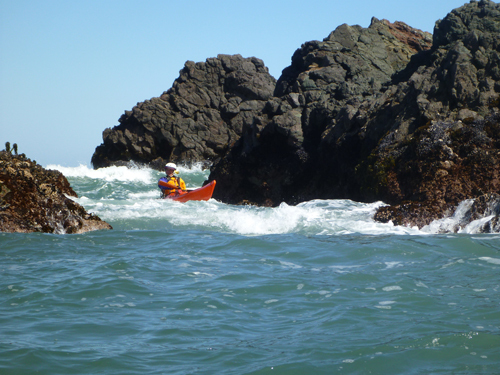 Last week Mark, Michael Morris and I drove up the coast to Southern Oregon, one of our favorite sea kayaking destinations. Steep cliffs, waterfalls, caves, long tunnels, exciting rock gardens and an occasional wild goat on the cliffs above make the place unique. In all the times that we’ve been there we’ve never seen another person on the water. It’s a great place to step away and play for awhile. Launching in a gentle breeze. The thing about Southern Oregon is that if conditions aren’t favorable, it can be very difficult, if not impossible, to get off the beach. The coastline is exposed, and large swell can make playing in caves and rock gardens treacherous. Wind is always an issue, and this particular day, the wind was blowing from the south, creating up to seven foot wind waves. The swell at three to five feet was small however, and launching from the beach was incredibly easy. 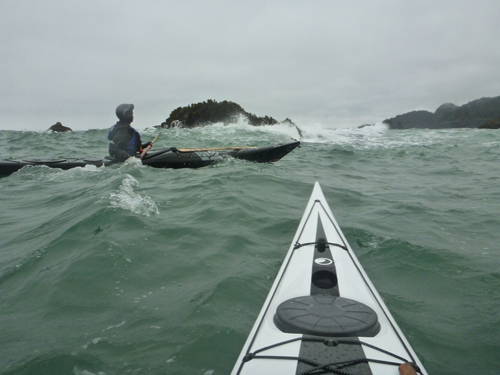 We paddled north with the wind, knowing that it might be challenging paddling back if the south wind picked up as predicted. One of the first features we reached was a deep cave with a waterfall in front. We took turns going inside and marveling at our incredible surroundings. 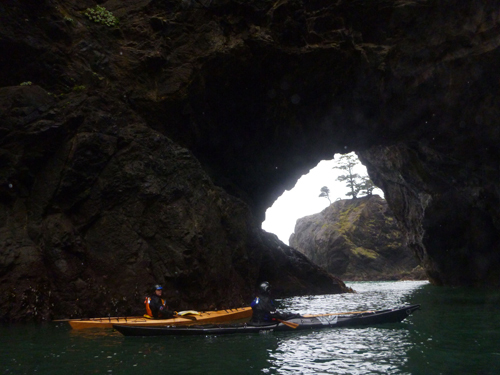 Throughout the day we tucked into cove after cove, exploring every crack, tunnel, archway and cave, some mild and others wild. Mark exiting a cave and passing a waterfall. Michael and Helen making their way though a row of archways. After several miles we turned back and were immediately hit by a strong headwind. 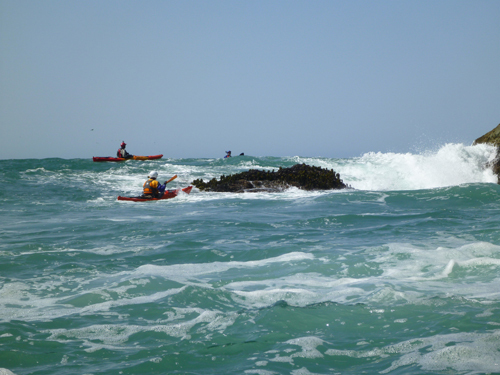 After paddling hard for about a mile and watching (and feeling) the waves around us get larger and more powerful, we stopped for a break and to regain strength for the journey back. We opted to take the most direct route, straight into the wind, and for the next two and a half hours we remained focused as we slogged back. Finally we arrived back at the launch, tired but completely satisfied with the day. Southern Oregon is a magical place, and I can’t wait to return. Photos by Michael Morris, Helen and Mark. 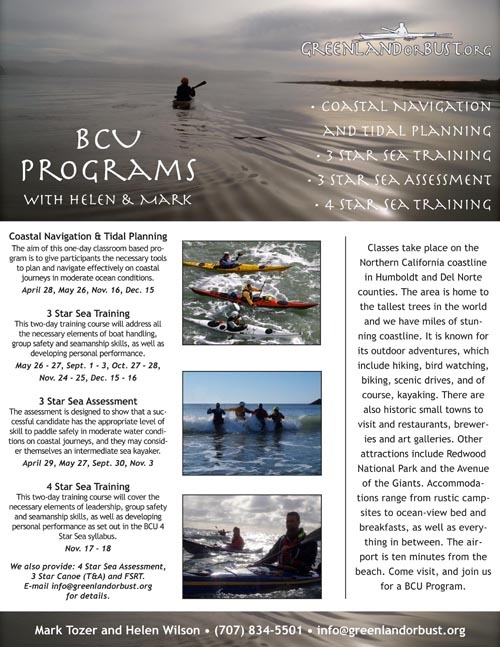 Prerequisites: An understanding of charts and practical navigation.